Darren Aronofsky has outdone himself in the metaphorical, symbolic, and insane nature of his storytelling. For the sheer spectacle of what he has constructed here, mother! is worth seeing. Jennifer Lawrence is terrific in what has to be, by far, her most challenging role to date. Michelle Pfeiffer's deliciously wicked turn as an unwanted house guest steals the first half of the movie. Say what you will about mother!, this movie grabs you and doesn't let you go from the start to the very end. A large majority of people going to see this are going to HATE this movie with a passion. And I'm using the word HATE here, to describe, most people's reactions. The movie is too crazy to properly defend. Whatever you like and admire about it gets overwhelmed and sacrificed at the altar of all the insanity that defines the film's progression. You think you're getting a Jennifer Lawrence domestic horror film. You're not. You're getting something completely different. The depth and nature of the subtext for what Aronofsky is exploring will be lost on many, confusing for most, and too pretentious for those who adhere to the themes he is addressing. Jesus, Lord in Heaven, I don't even know where to begin. I will say this regarding mother! : A vast majority of unsuspecting moviegoers will HATE this movie with a passion. You may think you are getting a Jennifer Lawrence domestic thriller-slash-horror film and you are technically correct. However, scenes involving military-style executions, the National Guard, self-immolation, and a heart, which we see beating within the walls of the Wife's home each time she chooses to lean against them, doesn't quite scream *Date Night* or *Netflix and Chill* for you and a potential cuddle-buddy. mother! tells the story of a Wife (Lawrence) and her writer Husband (Javier Bardem). The Husband is in the throes of fighting through severe writer's block and the Wife has given him his space to work, giving her the time to single-handedly renovate a spacious, round, Victorian-style home at her leisure. Loving isolation, an unexpected knock on the door during dinner surprises Husband and Wife. A Man (Ed Harris) arrives and he and the Husband become fast friends. When the Man apologizes for believing that their home was a Bed and Breakfast establishment and attempts to leave, the Husband invites him to stay overnight. The Man develops severe coughing fits and becomes very sick during the night, all observed by the Wife who cannot sleep. The next morning, a Woman (Michelle Pfeiffer) rings the doorbell and turns out to be married to the Man, who suddenly feels better. It is as if the events the Wife saw were not real, a mind's fabrication. As the Woman becomes increasingly frosty towards the Wife, the two men head out for nature hikes and walks. Later, and after promising to avoid a private room in the house, the married house guests go in anyway and destroy a very precious, large glass jewel belonging to the Man. Later, the couple's two adult children burst into the home and a fight ensues. When tragedy strikes, everyone decides to leave the house, except for the Wife, encouraged to stay back and tidy up the home. All of this description does not even scratch the surface of everything that goes down in mother! The plot only grows and intensifies, with bizarre visions and occurrences which begin to afflict and debilitate Lawrence's character more and more as the movie progresses. Writer/director Darren Aronofsky has crafted yet another film that grabs you by the shirt collar and refuses to let you be still until long after the movie has faded to black. Certain images and sequences in mother! are breathtaking, haunting, and powerful to experience. 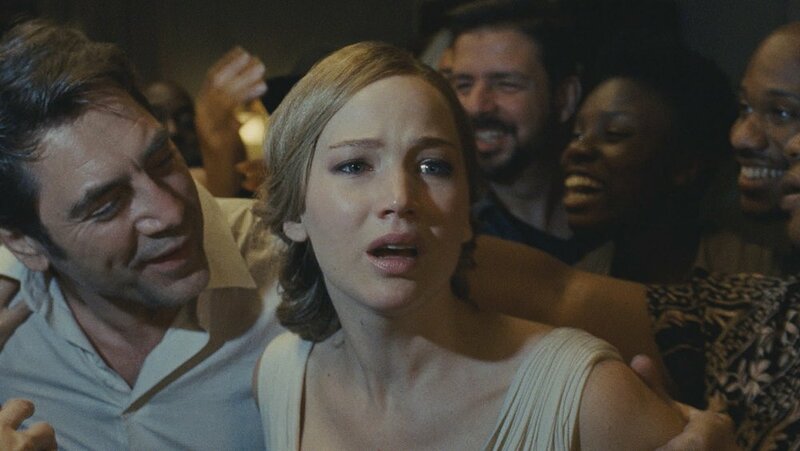 In creating mother!, cinematographer Matthew Libatique shot nearly every scene with Lawrence's character in suffocating, almost invasive close-ups. Instantly, this technique is disorienting to become accustomed to, and it leaves one guessing whether we are supposed to imagine that the Wife is losing her mind, not perceiving matters properly, or is literally watching everything break down around here. The sound design work in the film is stellar, and Aronofsky and his team craft an aural world of chaos, turbulence, and tension masterfully well. Lawrence is simply terrific. Pfeiffer steals every scene she is in, while Harris and Bardem are great as well. The acting is not the issue here though. It's everything else. And I mean Every. Thing. Else. Once a special event is arranged by the husband for the house guests, the Wife is treated terribly by the Woman and a steady stream of people start showing up. A pleaser - the Wife is always tending to the house. However, when the event spirals out of control, she snaps and demands, "Everyone get out of here!!!" She is serious and everyone obliges. And even that is not the half of it. Not. Even. Half. Aronofsky is not a kind and gentle filmmaker, but he lives in and for the confusion he creates. He cultivates that crazy, if you will, spinning our senses like a top and turns simple and basic situations into elaborate statements we, as an audience, are asked to analyze and personalize. How would you handle the pressure to lose weight or take drugs for the first time (Requiem for a Dream)? What if the pressure of being the best in your chosen field began to wear you down and your mental health started to deteriorate (Black Swan)? What if you truly believed you were faced with your own mortality (The Wrestler)? In mother! the characters are nameless in story, the symbolism is rampant, and a second viewing admittedly might unlock more clues embedded within the film. But man does this thing go off the rails. In a final half hour that truly must be seen to be believed, unbridled chaos fills the screen at every turn. Without spoiling anything here, let's just say that I have seen thousands of movies in my lifetime and I struggle to think of a mainstream, large studio release, that compares to this. And complicating matters, Aronofsky crams so much metaphor and symbolism into the film, mother! becomes increasingly hard to follow. While a general consensus is beginning to form around what might be happening here, mother! remains a very hard nut to try and crack. By the end, this is all a rather vicious and nasty parable, which brings forth lots of questions and very few answers. By the end, Aronofsky is hoping you have faith to figure this out and he does not shy away from exploring themes of loyalty, belief, narcissism, and gluttony, to name just a few. One point that comes through loud and clear is mother! also serves as something of a rumination on what it takes for people to change their ways. If we recognize that we are destroying ourselves, either individually or collectively, do we ever reach a point where we can no longer turn back and right our wrongs? Amid all the theories, analysis, and groupthink that mother! will inspire in the days and weeks to come, let's not lose sight of the fact that 1) Jennifer Lawrence seems to be able to do anything anyone throws at her. 2) mother! is masterfully made on a technical level and is stunning to watch on the big screen. And finally, 3) a significant portion of mainstream audiences, and more discerning moviegoers, are going to reject this film hard. Once you begin to see the connections Aronofsky is making, mother! does not feel quite as obtuse and cold to the touch. However, the film is constructed and crafted in such a menacing and challenging way, that it becomes very, very hard to recommend to anyone. Perhaps I should suggest you simply go with God on this one? Starring: Jennifer Lawrence, Javier Bardem, Ed Harris, Michelle Pfeiffer, Domhnall Gleeson, Brian Gleeson, Kristen Wiig.